Biscuit major Britannia has ventured into the fairly new baked snacks category, launching a baked wheat snack called Time Pass targeted at the youth. The company claims that the wheat product is free from trans fat, MSG and cholesterol. The snack is being made available in three flavours - Mindless Masala, Tapori Tomato and Loafer Lemon - at two price points, Rs 5 and Rs 10. Since it is targeted at the youth, the brand has adopted a language that is not pretentious and appeals to the youth. Time Pass aims to participate in the banter of youth and makes 'doing nothing' a legitimate option. Interestingly, Britannia usually communicates with housewives or children. The youth is a new target group that the company is speaking to in this communication. It has chosen the radio route, which allows interactivity as the youth can easily connect with radio and music. 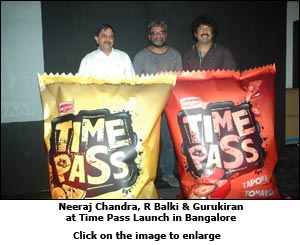 R Balakrishnan (Balki), chairperson and chief creative officer, Lowe Lintas, who conceptualised the campaign, says, "The attempt with Time Pass was to introduce an exciting offering in Britannia's snacking portfolio of 'delectables' for the youth - a brand that is an anti-thesis to the mindless rat race. It is dismissive, indifferent, irreverent - a way of life." Shalini Degan, category director (delight and lifestyle), Britannia Industries, speaking on tackling competition in the category, says, "Baked snacks are a very new and nascent category in the Rs 6200 crore Indian snacking market and will obviously see a slew of launches one after another. However, the leader will be the one that is able to delight consumers with taste and is able to connect and satisfy them using this new technology effectively."